I love this time of year! It makes me so giddy inside! I love the changing of the seasons, and pumpkins and the changing of leaves. I love the holidays; Halloween, Thanksgiving, Christmas, New Years and of course my birthday (yep my birthday is a national holiday if you all didn’t know! HAHAHA) I love all the decorations, and food, and traditions. I love it all! And for me I think it is so awesome that I live so close to my family and ‘in-laws’ that we make it work to spend some of each of the holidays with each family. And I love that I get to experience the food and traditions of both families! And because Eric and I both have large families there is always a TON of food. And a TON of food means a TON of leftovers! Of course these leftovers are perfect just reheated, or made into a traditional turkey sandwich (I love sandwiches made with Thanksgiving turkey leftovers, and look forward to them all year), but depending on your crowd and the amount of turkey you have left over you might want a few more options to use it up. So this week, while all the other blogs, food TV shows, and recipe websites feature your typical Thanksgiving day menu ideas I will be focusing on the day after! 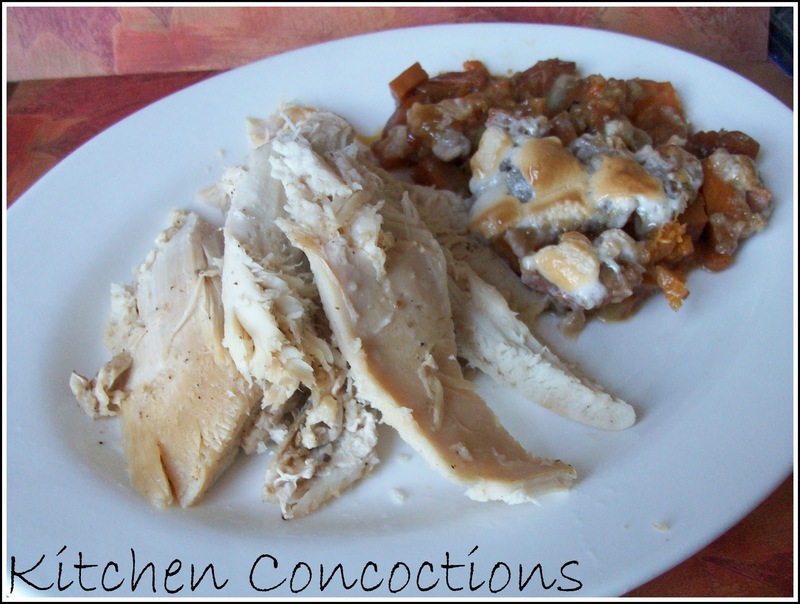 Which means this week is left over turkey recipe week! But first, before we can have left over turkey we must first cook the bird! Now I know a lot of people (I would say most people) are afraid to be in charge of cooking. I know I was quite nervous the first Thanksgiving I hosted myself. I didn’t want to under cook it or over cook it and it be to dry or for it not be ready by the time everyone was ready to eat. Well folks I have an absolute easy peasy roasted turkey recipe for you today. 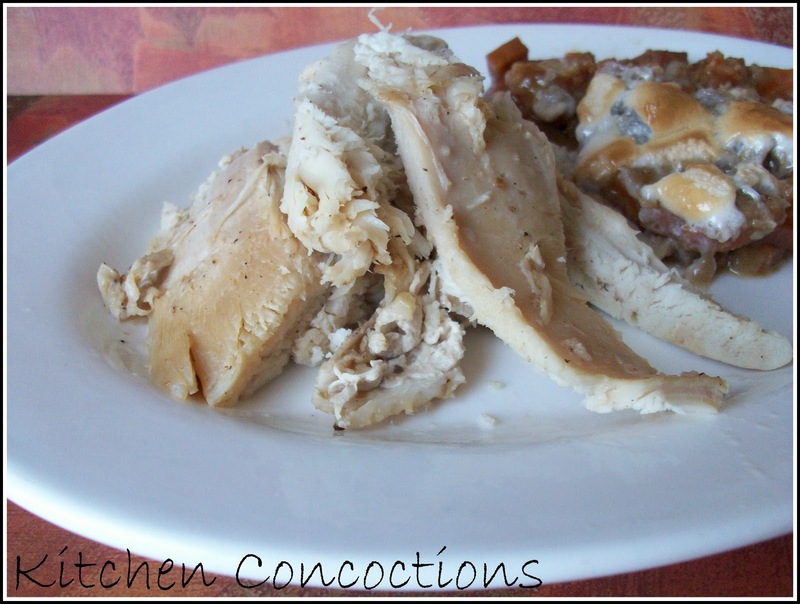 This turkey only takes minutes to prepare, two hours and 40 minutes to cook, and is the juiciest, tenderest, moistest turkey I have ever had! Easy. Peasy. And the turkey is done! Notes: This is definitely an unusual cooking method for a turkey. Some sites and guides (such as this one) advise not using paper bags to cook turkeys. I used one and did not have any problems. But I did have reservations about doing so. So please do what you feel most comfortable with. I did recently discover that Reynolds makes a turkey roasting bag. I have not tried it but I am sure that it would work just as well! Preheat the oven to 500 degrees and let it heat for one hour. Meanwhile, remove giblets and neck and wash the turkey. Fill the cavity of the turkey with carrots, garlic and onion. Combine the lemon juice, salt, pepper and poultry seasoning in a small bowl. With your hands, rub the entire turkey with the lemon juice mixture. Meanwhile, grease a large brown paper bag with butter on both sides. Remove the roasting pan from the oven and carefully (because the turkey and roasting pan are HOT) make a tent out of the paper bag and drape it over the turkey, taking care to tuck the sides of the bag into the roasting pan (otherwise, the butter will drip off the bag, leap onto the oven burner and possibly create a large fire). Turn the oven down to 400 degrees and cook the turkey for two hours and 30 minutes. Remove the roasting pan and turkey from the oven and let turkey sit for 20 minutes. Remove turkey from the roasting pan and pour the drippings into a medium-sized saucepan. Bring to a boil. Make a slurry from flour and water (to the consistency of thick, heavy cream) and add to the drippings until desired consistency is reached to form gravy. « Meet Super Ham’s Trusty Sidekicks….